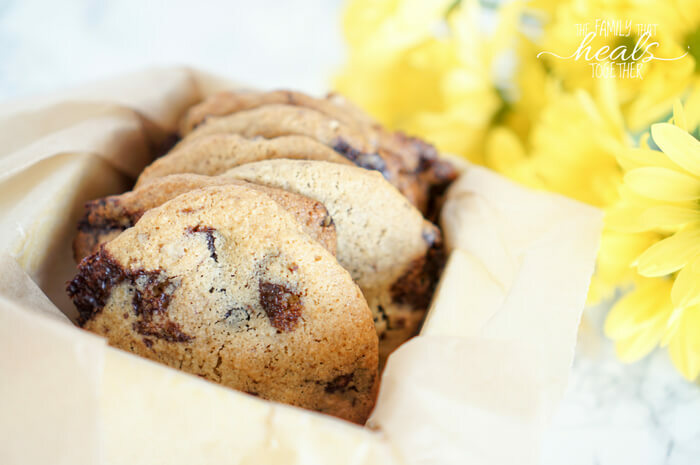 Although I have a healthy chocolate chip cookie recipe here already, I’ve been wanting to recreate one that is GAPS Diet-friendly, meaning no starches, honey-sweetened, and using a chocolate chip recipe without sugar. I am more than thrilled to report that after several attempts, I finally nailed it! You’ll find my GAPS Diet Chocolate Chip Cookies below. I have remade chocolate chip cookies every which way for every type of healing diet I’ve done. I’ve replaced the eggs and butter to make them vegan; I’ve made them gluten free (these are truly the absolute best if you want to really indulge and don’t mind some real deal sugar); and, of course, I’ve made my paleo version, which, if I say so myself, are the best paleo chocolate chip cookies I’ve tried to date. Of course… since our family has been primarily on the GAPS diet for the last couple months, I knew at some point my cravings would get the best of me. 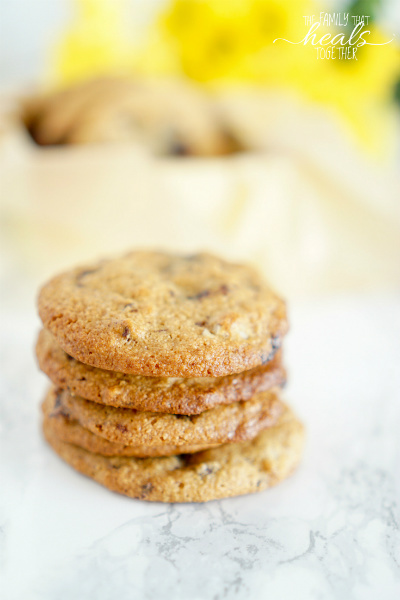 I HAD to to make a healthy chocolate chip cookie recipe we could have on GAPS. 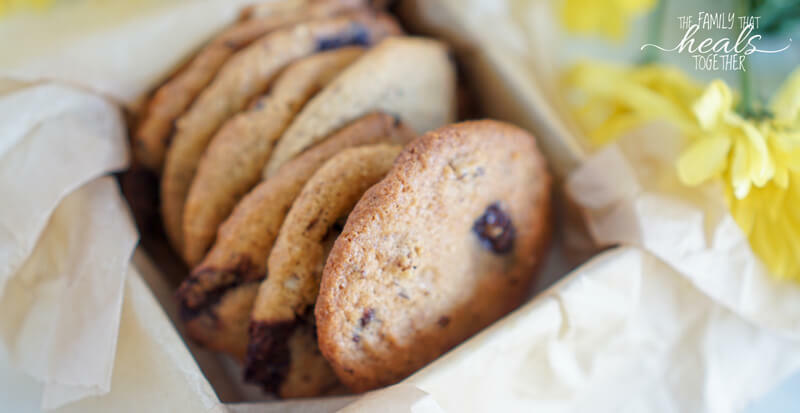 I was a little apprehensive about using almond flour for my chocolate chip cookies, although it was the obvious choice for the GAPS Diet, as it’s high in fat and protein and low in starchy carbohydrates. It turned out that almond flour worked perfectly, and with just the right combination of ingredients and technique, you won’t have to flatten these bad boys out. They spread perfectly as they bake. 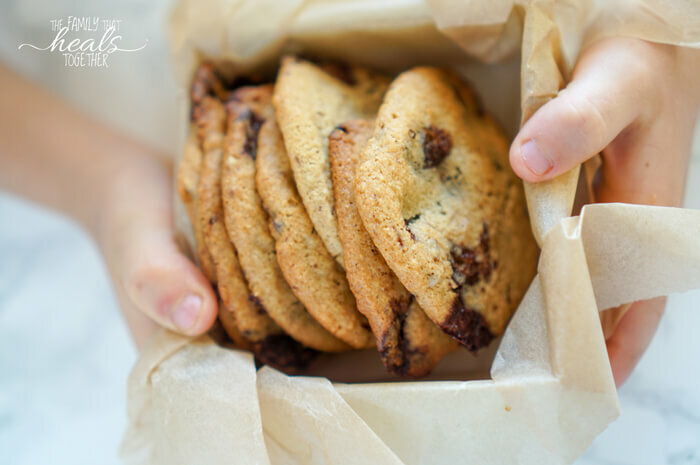 In addition, if you’re sure to get a very finely-ground almond flour, the texture isn’t too different from the classic cookies you’re used to that use wheat flour, especially if you take the extra time to sift it. It had truly been a while since I’d treated my boys to a good chocolate chip cookie. They celebrated through every iteration of these GAPS-style ones, but we all agreed, this final version was the best of all. I made them up early this week while the boys played outside (after the 109º weather had subsided). Something about summer and sunshine gets my creativity flowing and I want to bake, which makes no sense when it’s over a hundred degrees outside. I also enjoy throwing down a nice, cool, refreshing popsicle now and again. 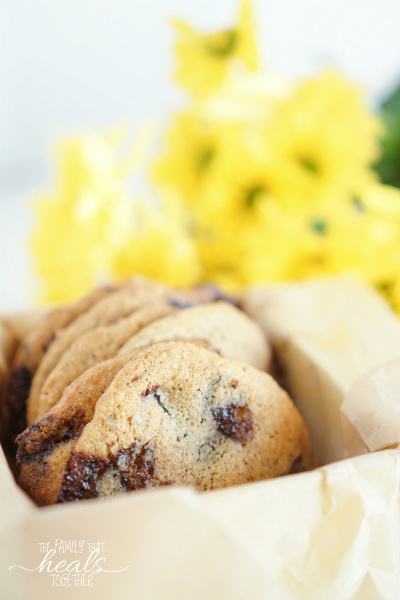 But for some reason, summer and chocolate chip cookies go together in my mind. Summer so far has been a combination of hiding from the heat and watching (too much) Netflix, now-banned video game playing, running in circles around our property, using questionable judgement while riding the four wheeler, and chasing and catching various critters. 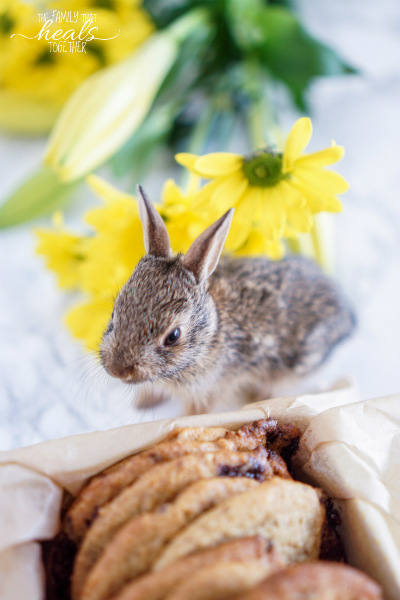 This week’s unlucky captive pet is a sweet, little bunny who has somehow survived in this home with four boys for something like four days now. My oldest plopped her down while I was photographing these cookies and I couldn’t resist capturing her absolute cuteness. 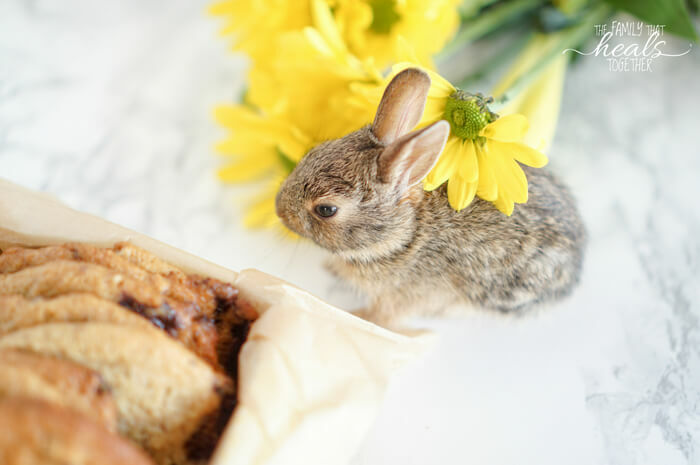 Bright yellow flowers, (healthy) chocolate chip cookies, and baby bunnies. Yes, this feels like summer. As summer should be. Gosh, I hope she lives because she is just the sweetest, cutest thing. She eats every little piece of kale, grass, and strawberry my boys put in front of her little nose, and we’re giving her water with colostrum, so I’m feeling like she has a good shot. But you came here for my healthy chocolate chip cookie recipe. Ahem. I’ll get on with it. Listen, it’s chewy. It’s just a little doughy in the middle; just a little crispy on the outside. Sweetened only with honey for optimal digestion and absorption. Higher in protein and fats and lower in carbs (if you wanted to make them keto, I think you could sub some stevia glycerite and make some small adjustments, but I haven’t personally tried it). I hid a baggie of them away and then accidentally ate all but one myself. Oops. The Mister was thrilled when I whispered that I had saved him one and where he could find it. I knew that in order to make a truly GAPS-friendly chocolate chip cookie, I would have to make the chocolate chips homemade. So I did! And it was so easy and only took a handful of ingredients. Honestly, I had them made in about half an hour. 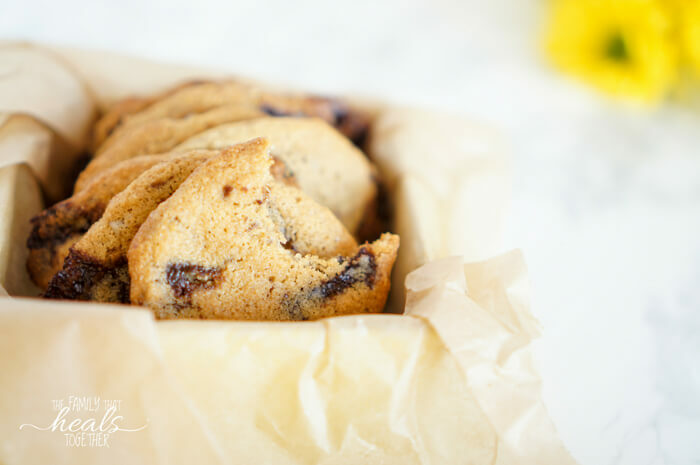 You can find my easy chocolate chip recipe here, but if you’re not into homemade (or patience), you can always grab a bar of Pure 7 chocolate or a Honey Mama’s bar, both of which are sweetened with honey. However, making them yourself will save you money and, I think they taste better in these cookies. 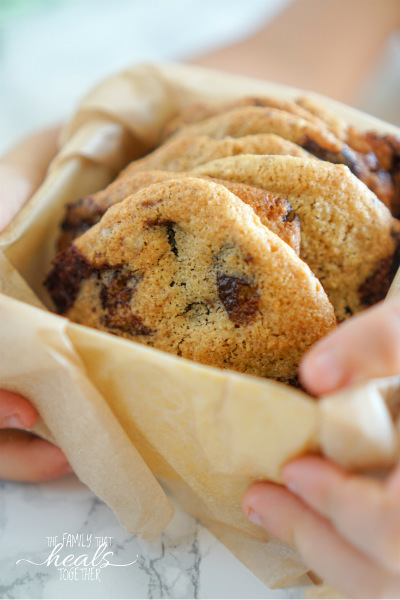 You can get your hands on your own batch of dangerously good, but not-so-sinful chocolate chip cookies using the recipe below. Don’t say I didn’t warn you. In a medium mixing bowl, beat butter and shortening on high with a hand mixer, creaming together until fluffy, about 30 seconds. Add honey and beat once more until combined. Add vanilla and eggs and beat until combined. Batter may become a bit clumpy looking. This is fine. Add the almond flour, coconut flour, baking soda, and salt and beat with hand mixer until combined. Stir in chocolate chips and pecan pieces by hand, then place bowl in refrigerator for 2-4 hours. 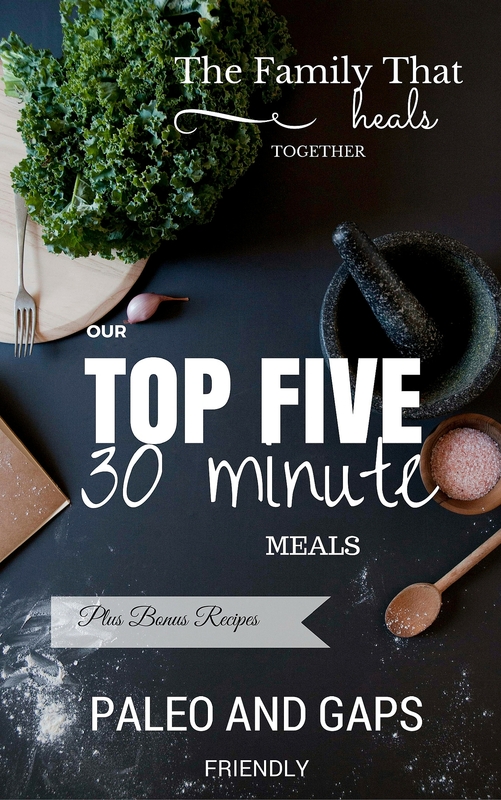 Alternatively, you can freeze the dough for about an hour. Line a large baking sheet with unbleached parchment paper, or use silicone baking mats like this. Scoop tablespoon-sized balls of dough onto lined baking sheet, two inches apart. Bake for 15-18 minutes, until cookies are slightly browned on the edges. For best results, allow cookies to cool completely before moving them, as these cookies are delicate. 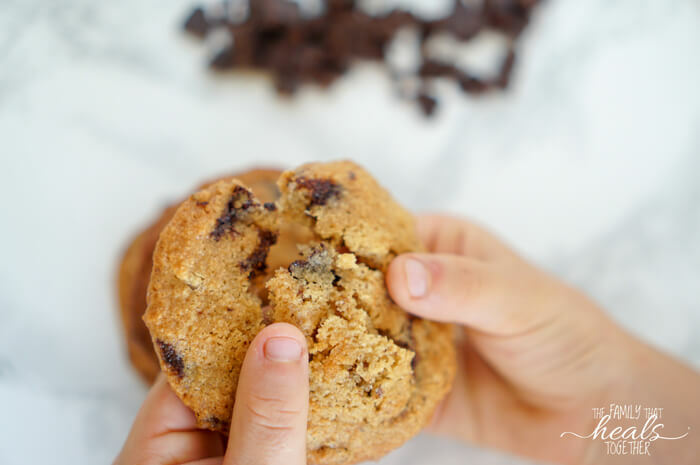 *If you don't want to make chocolate chips, but still want to keep these cookies GAPS-friendly, you can use either a Pure 7 chocolate bar or Honey Mama's chocolate bar (I find them in the refrigerated section at the health food store), cut into chunks. I've tested both and both work well in this recipe. Just be sure to share!